Infrared satellite image at 11.00am 28 November 2015 courtesy of JMA. Higher cloud tops are blue and green indicating areas of heaviest rainfall. 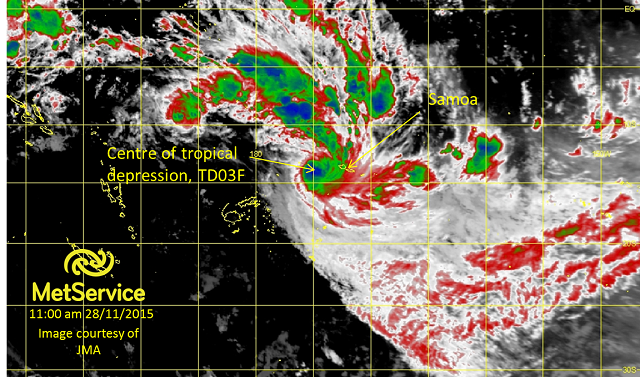 The centre of TD03F was located 240km to the west of Samoa at 7am this morning, with a central pressure of 997hPa. The tropical depression is gradually deepening as it slowly tracks southeast. You can see on the tropical cyclone forecast track map below, that TD03F is likely to pass just to the southwest of Samoa, potentially bringing heavy rain and strong wind to the country. It is likely that TD03F will be named a category one tropical cyclone later today. MetService will continue to monitor the progression of TD03F with our colleagues at the Fiji Met Service.